In the 19th century, the first railway on Rügen, Germany's largest island, ran from Altefähr to Sassnitz and was mainly used for travelling to Sweden. Passengers, however, still had to change to the ferries in Altefähr and Sassnitz. Therefore, the famous Königslinie (the King’s line) was built. It was first operated as a mail steamer line from Sassnitz to Trelleborg and later, in the early 20th century, as a train ferry service. The official opening date was in 1909 when the first train was operated in the presence of the King of Sweden and the German Emperor. 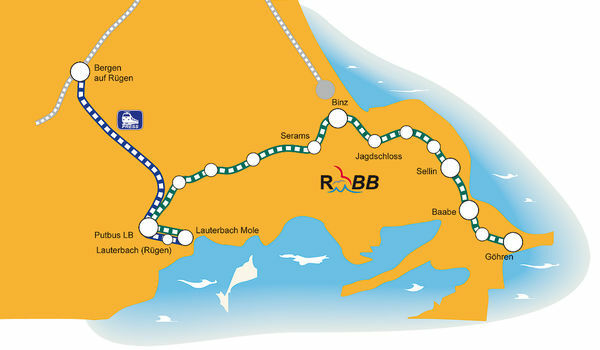 Thanks to its new rail connection, the island of Rügen soon developed into a tourist destination, with even further branch lines having been built. The first one of those branch lines connected the Königslinie with the town of residence of the aristocratic family of Putbus and the first seaside resort of the island near Lauterbach on the Rügischer Bodden bay. In 2009, exactly 100 years after the Königslinie had been completed, this traditional railway line started to be operated by the PRESS as a regional and local rail passenger transport service (SPNV). This service perfectly complements and extends the existing railway service of the Rügen Narrow-Gauge Railway, nicknamed Rasender Roland (Dashing Roland). The unique coexistence of the two railways is owed not only to the fact that they belong to the same operator, but also, and above all, that they both use the famous three-rail track between Putbus and Lauterbach Mole. The Press seeks to offer a high-quality, modern and up to date local transport service, including targeted marketing promotions and attractive offers to attract prospective passengers. The RB 26 railway line is an integral part of the local public transport (ÖPNV) network of Mecklenburg-Western Pomerania, connecting the region around Putbus – a particular tourist attraction – with Bergen in the centre of Rügen. In Putbus, there is a direct connection to the Rasender Roland narrow-gauge railway, which is one of the tourist attractions on the island of Rügen and a direct rail connection to the famous Baltic sea spa towns of Binz, Sellin, Baabe and Gören. On Rügen, the main office of the PRESS is their train station in Putbus. Its renovation, restoration and remodelling resulted in a modern and contemporary service centre with customer office, ticket sales and other additional facilities. By having thus created a further tourist centre on the island, we have made our contribution to the further development of the region around Putbus. The two routes are similar also in that, particularly for tourists, they run on regular riding days, using historic vehicles. For additional special rides on historic vehicles, we use our own steam or diesel locomotives and traditional carriages. Furthermore, Putbus station is available to interested railway associations arriving on their trains not only as an attractive destination but also as a supply station for their steam locomotives. Operating historic vehicles during regional events along the route helps raise regional and national public awareness of the railway line. We invite you to join us for a ride or come to our railway station festival held in May every year.